Let's find out a little more about her. Cosmos - Tell us a little bit about yourself please. 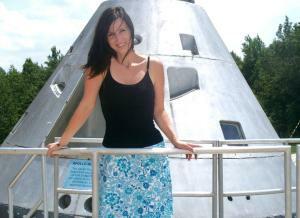 Karen Jennings - I am currently the Vice President for the Astronomy Foundation, a non-profit astronomy sciences advocacy and outreach organization. The Astronomy Foundation's mission is to increase interest and create enthusiasm for astronomy. For example, some of our work includes promoting star parties for the public, attending and supporting astronomy-related science and educational events. In addition, we are dedicated to building our astronomy community by bringing together telescope-industry expertise and resources to help promote and support astronomy awareness, astronomy education, and create partnerships with educators and astronomy clubs. Cosmos - When and why did you decided to become an astronomer? What did you first want to be when you were a child? Karen Jennings - Perspective. About five years ago, I noticed that my family's activities were centered around video games, computers and TVs. The only connection I felt was to a wifi device. We were over scheduled, stressed and in desperate need of back to basics perspective. I had an inexpensive 50mm refractor telescope from a toy store down in our basement. I dusted it off, set it up on the back deck and pointed it at our moon. We loved looking at all of the craters and seeing detail you cannot observe naked eye. We pointed the telescope at the brightest object in the sky (thought it was a star) and saw Jupiter and the Galilean moons! We were absolutely hooked! If we could see Jupiter with a child's telescope, imagine what could we see with a better one? Our first "real" telescope was an 8" Dobsonian mounted reflector. Aperture fever set in and we added 16"+ telescopes to our inventory. Today, my husband is an amateur telescope maker and my living room looks like a showroom for our telescopes. I refuse to store them away because I feel they are works of art. I wanted to be a dancer. I went Temple University to study Psychology and Dance and earned a BA. With an emphasis in neuropsychology, I became active in experimental psychology and began conducting, writing and presenting research. I took a leave of absence from a PhD graduate program to start a family with my husband. Cosmos - Which are your hobbies? Karen Jennings - I enjoy anything that involves moving your body. I love running and strength training. I also enjoy dance, theater and comedy. Cosmos - Who is your lifetime's figure reference in this field and why? Cosmos - Do you think we need more minds like Carl Sagan to explain in a simple manner the complex matters of Astronomy to the general public? Is there someone in the present that can do that? Karen Jennings - We are fortunate to have people like Neil deGrasse Tyson, Michelle Thaller and Brian Greene who popularize astronomy and work to bring complicated science down to Earth for the general public. Neil deGrasse Tyson engages the public in a way that excites people in wanting to learn more about astronomy. Tyson is brilliant in taking complex astrophysics and making it accessible and understandable to his audience. An example of this would be his description of spaghettification in his book "Death by Black Hole" which details the vertical stretching and horizontal compression of objects near the strong gravitational field of a black hole. Cosmos - People seem to be confused between astronomy and astrology? Why? Will this ever end? Karen Jennings - I don't think astrology will end anytime soon, debunked or not. It provides entertainment, perhaps excuses for behavior, but I believe it's pseudoscience. The idea that a position of a constellation relative to the day and month you were born and a gravitational pull or electromagnetic energy that predetermined your personality, will and destiny doesn't jive with simple physics. How do astrologists reconcile the precession of the Earth? Earth’s axis wobbled a bit, so the current position of zodiac objects are no longer consistent with the tenets of astrology codified over two thousand years ago. Cosmos - Now the main question: what's up in astronomy nowadays that's is complety new in your opinion and why? 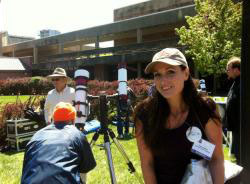 Karen Jennings - Large aperture amateur telescopes. The kind of equipment that is available nowadays means that much more of the sky is accessible than in the past. Big aperture, fast focal ratios, 100% degree field of vision eyepieces make some very respectable yet affordable gear for the amateur astronomer. Cosmos - Do you think that the study of astronomy will ever end? Karen Jennings - The study of our universe will never die because we are driven by a primal intrinsic desire to try and understand why and how we are here. Astronomy as we know it is in its infancy. As technology improves, so will the discoveries. Professional and amateur astronomers make new discoveries every day. We are just now starting to scratch the surface of exoplanet research. Cosmos - What was, in your opinion, the major breakthrough in astronomy these last few centuries? Karen Jennings - The astronomical observations that proved Einstein's General Theory of Relativity: Gravitational Lensing and Waves; Expanding Universe; Black Holes. 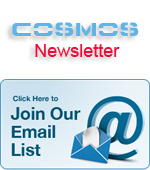 Cosmos - Do you agree that social networks like Facebook are benefical to the expansion of the astronomy's knowledge? Karen Jennings - Social media is a very important tool for astronomy outreach. These apps can help advertise and promote all things astronomy outreach from local sidewalk astronomy events to larger star parties. Every astronomy club should be employing social media to help create and spread awareness of their organization and the outreach work they are engaged in. For astronomy knowledge in general, it has been an amazing tool! Consider the success of NASA's Mars Curiosity Rover with “its own” official twitter account. Curiosity posted updates about its journey to Mars, and shared the step by step preparations for the trip. The rover's landing was famously called "7 minutes of terror”! Everyday people outside of NASA got to see images of Curiosity's view of Mars. Cosmos - Finally, what message would you like to leave to those who are starting in the field ? Karen Jennings - Welcome! Countless night sky wonders await you my friend! Join your local or online astronomy club, go to a star party and don't be afraid to ask questions. You don't need expensive equipment or extensive knowledge of astrophysics. Start with simple sky charts and binoculars. Best wishes and clear skies!